Missing Teeth? Dental Implants can Help! Dental implants have quickly become the preferred choice to replace missing teeth. With implants, you’ll replace your missing teeth with prosthetics that closely mimic your own natural teeth. As a result, you’ll enjoy the same benefits as having natural teeth without the discomfort of dentures or complications of leaving the missing teeth untreated. We provide dental implants in our Westport office to help you increase your quality of life while reversing the damages of tooth loss. You’ll gain a beautiful new smile with a permanent solution to tooth loss. Dental implants involve surgically inserting bio-compatible titanium posts into the jawbone. The jawbone naturally fuses to the implant, which will act as the root of the tooth, providing a strong foundation for the prosthetic. Once the jawbone has healed, the prosthetic teeth are then anchored into the posts, providing you with a permanent solution to missing teeth. The teeth closely mimic natural teeth in both appearance and function. In addition to a natural looking smile, single and multiple tooth implants offer multiple benefits. Since the teeth are permanently placed into the jawbone, there’s no slipping or discomfort when eating or speaking. Your tooth replacement will be held securely in place to increase your biting force by as much as 70 percent. Implants not only improve your quality of life, but protect your oral health as well. Implants preserve your remaining bone while stimulating new bone growth. With permanent support of the facial structures, you’ll prevent damage to surrounding teeth by giving them the healthy support they need. You’ll have the healthy, functional, and attractive solution to treating tooth loss. When you have missing teeth, or even just one missing tooth, your teeth, bones, and surrounding structures no longer have adequate support or stimulation. As a result, these areas begin to deteriorate due to lack of stimulation. The lack of support causes the surrounding teeth to begin to shift, leading to bite troubles, gum disease, and tooth decay. Overtime, as the bone and structures begin to deteriorate, the facial appearance will change from the lack of support. 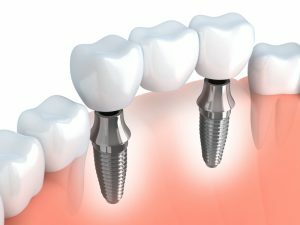 Dental implants fill the empty space, providing the needed support to the teeth, gums and bones. This helps to not only stop bone loss, but also stimulates new bone growth. The implants will promote your oral health and reduce the risk for additional complications while giving you an attractive new smile. As a cosmetic and family dental practice, we offer dental implants. We will evaluate your tooth loss and oral health to create a treatment plan. We will be able to restore your smile and oral function using the safe and effective implant procedure. Let us improve your quality of life and oral health while giving you a radiant new smile. Call our Westport office at (203) 227-8700 to schedule a consultation today for dental implants. Comments Off on Missing Teeth? Dental Implants can Help!